Well, you can never have enough AA batteries. 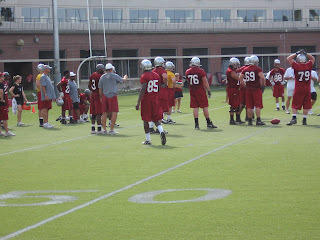 I braved the 98 degree heat to watch the A squad in their afternoon practice yesterday, only to have my camera die on me before I could get any really good pics. Cougar Nation, I have let you down. It was a rookie mistake I wont make again, you can count on it! So without my own defense against the merciless sun I made my way round the field and got a few shots off before the camera went kaput. I am sure we are all concerned about Dwight Tardy’s progress on his surgically repaired knee and I headed straight for the running backs. Coach Broussard was putting them through the paces, yelling, “Trust your feet, eyes up! Don’t look at your feet! Why are you looking at your *&^%$ing feet?! Eyes up!” and so on. Sounds good to me. 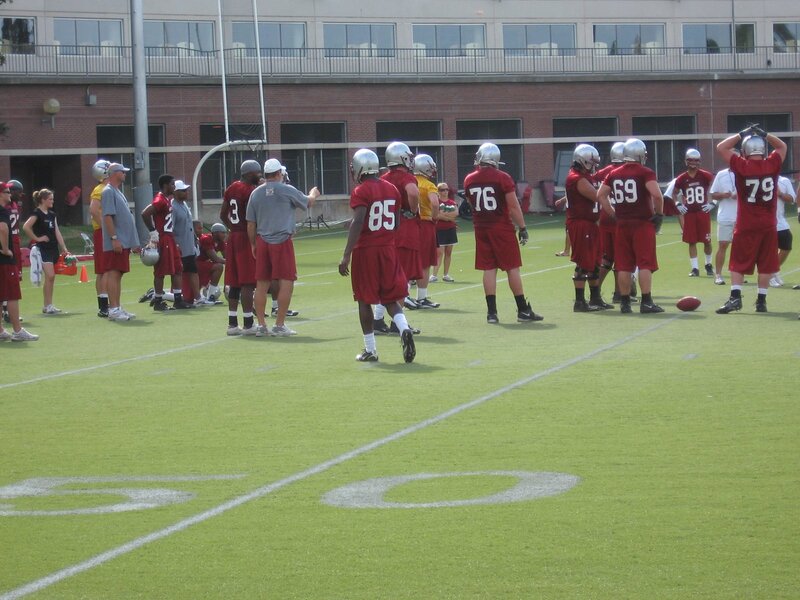 As they lined up for drills you can see Tardy, 31, in the back with his neoprene knee brace pulled down. I took this as a good sign that he felt confident without it. He seemed to pay a lot of attention to how the knee felt after each burst of activity, but I never saw him labor, or limp at all and he looked just as sharp and confident as the other backs in their drills. Oh yeah, and he was the only one keeping his “&*^%$ing eyes up”, as coach Broussard was imploring them to do. With a healthy Tardy and an elligible Ivory, I am really excited about this unit as a whole. Seeing these guys up close and personal did nothing to change that. The helmets-only look is not very flattering, they look like a bunch of bobble heads. But regardless these guys still passed the eye test, or the airport test, as it is commonly called these days. I am sure many of you are also anxious to hear how Mr. Speedypants, Jeshua Anderson looks. Well, talk about passing the airport test, yowzah! As you can see in the photo above captured with a special high speed lense, he wears number 85, but you usually just see a white streak. Anderson’s athleticism is in the realm of freakish and I got to see him pull off one particularly great grab, leaping over a defender for a Rogers thrown ball that looked like it was going to sail through one of the CUB windows. More than once I saw defenders simply pull him to the ground as he made his first move on them and it was obvious they were about to get clowned. I would like to see him continue to get stronger, and fight through a lot of that grabbing and holding like Brandon Gibson does, but he is definately bulked up from last year. He was a little gimpy after contact and while I never want to call a player’s toughness into question based on skelly drills, I do worry if he is a bit fragile. As Coug fans we are used to being one injury away from disaster, so its always on my mind. The receivers are another unit where I honestly believe, crimson tinted shades aside, we are just loaded. We all know what Brandon Gibson does to defenses and the reemergence of Michael Willis so far as been a sight to behold. Two other guys that really stand out when you watch practice are Benny Ward, 15 and Anthony Houton, 88. They both have great size and athleticism and I wouldn’t be surprised to see one or both of them really emerge as a weapon this year. As for the rest of the offense, I didn’t get any really good captures, but below you can see Rogers lining up behind center for some skelly against the starting backers and DBs. Both Rogers, 17 and Lopina, 9 look the part, but it is clear they bring different things to the table and the coaches are going to play to their strengths. You see Lopina run a lot more designed QB runs and option plays, but he still throws a nice ball. 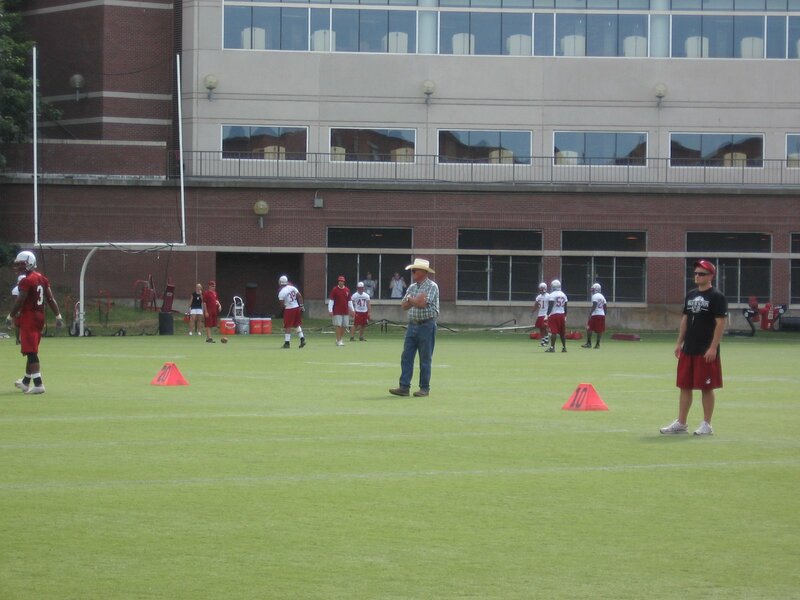 It looks like shotgun is going to be our bread and butter this year and the drills include practicing hand-offs in shotgun with the coaches throwing intentionally bad snaps. 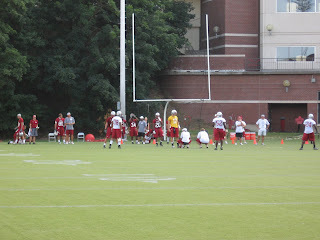 I didn’t get to see too much of the offensive line, so I will watch more closely in the coming days. Now some of you (Ptown) have reminded us in the comments that we don’t play in the WAC and defense matters too. Well I agree, and I was very curious to see one defensive unit in particular, our defensive line. That my friends is a buffet’s worst nightmare. 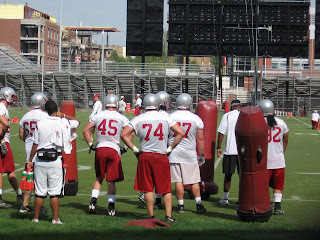 As you can see, big number 74, Andy Roof is practicing and no indication yet that he wont play. To his right are Eichelberger, 77 and Ahmu, 92, two seniors we are counting on to have solid and healthy campaigns in ’08. Clearly neither of them spent the offseason competing to be America’s Biggest Loser. Look at Andy Mattingly, 45. I cannot believe that guy was a linebacker! He looks D-end all the way to me. Just coming into the picture on the left is Kevin Kooyman, 93 who, together with man-child Mattingly off the other end, could be a huge problem for opposing QBs this year. Don’t fret (yet) folks. This unit has some promise. In no-pads action it’s hard to get a good read on them, but they’ll be strapping on the armor soon and we’ll get a better idea how they’ll be. With Mattingly, Kooyman, Mullinex, and Graise as our D-ends, I think its safe to say our concerns are at the tackle position. Sounds like a job for my main man, Toby Turpin! 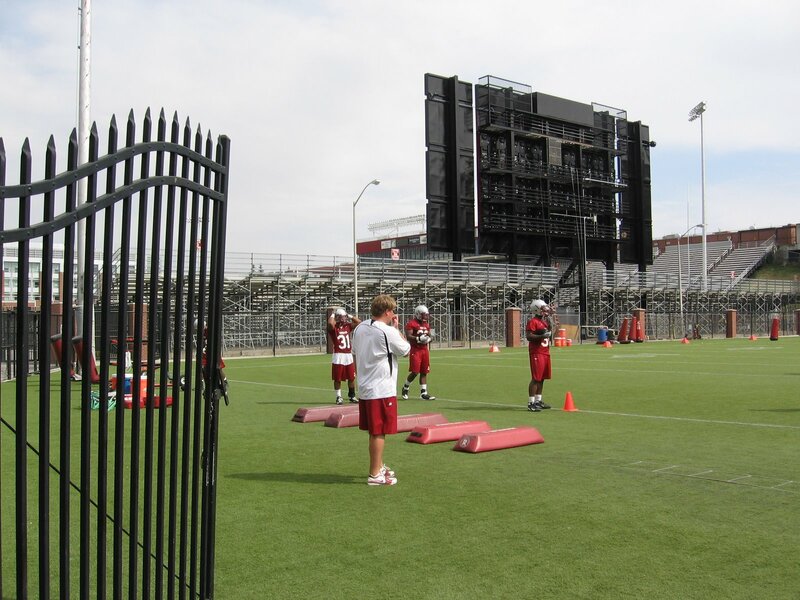 I wasn’t able to give our backers and DBs the attention they deserve, so I’ll try to get a read on them in future practices and scrimmages. One guy that did stand out to me was Devin Giles. 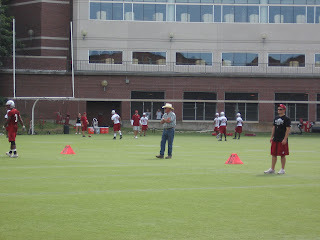 He has good size and I was surprised he wasn’t on the depth chart. They are going hard all day, every day against the likes of Brandon Gibson and Jeshua Anderson, so I am confident they are learning fast and will be ready. You are currently browsing the archives for the Steve Broussard category.